Established since 2005 V.I.P Almeria are a very pro-active and progressive agent who act for the client's benefit. 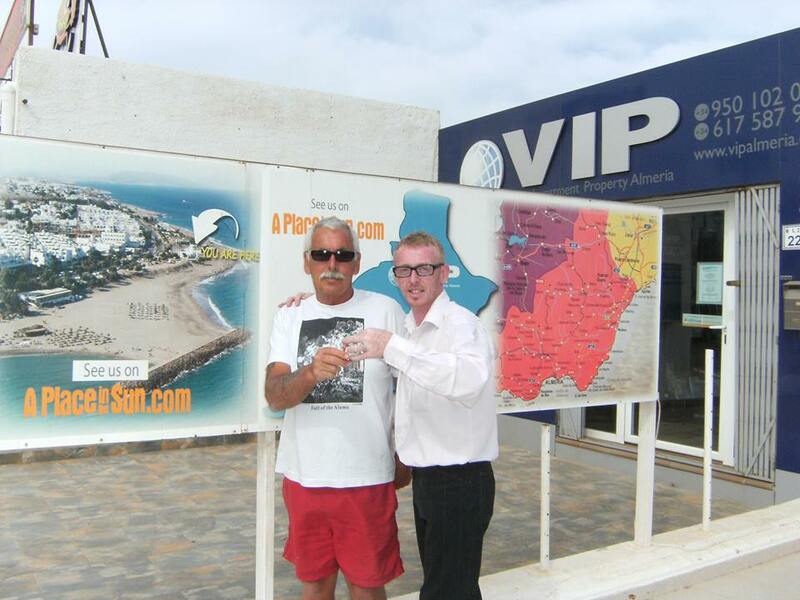 In 2012, Steven Howlett was selected as the "Almeria Area Expert" for the UK TV show "A Place in the Sun" - Summer Sun and was interviewed about Mojacar and the surrounding Coastline. Steven has being involved in a number of other Shows showing property options to clients. We even have our own profile Section on "A Place in The Sun"
Many different aspects of the industry are now available from our beach office such as Sales, Valuations, Survey, Architect plans, Community Administration, Insurance, Planning and Property Registry solutions including Land Taxes. We are happy to discuss your needs and in exchange for your business deliver happy results. Now in 2019, we have already introduced many new clients to the area after very successful Property Expos. Our Client portfolio varies of Northern European and Nationals. We want people to enjoy this fantastic unspoilt natural area and have assisted so many integrating to the region which a strong cultural identity. Many cultural phenomena that are seen internationally as distinctively Spanish are largely or entirely Andalusian in origin. Think about flamenco and certain Moorish-influenced architectural styles. V.I.P Almeria is known for its strong portfolio of all types of properties ranging from re-sales and distress sale opportunities. We hold collaborations with Developers of Key Ready products at vastly reduced prices. It is a good time in 2019 to consider Spain as a second home destination and we are here to present sound, straight talking advice. As everyone is different in their needs and criteria; If the property you want is not already on our books, VIP Almeria are specialists in sourcing property investments to suit every need via our excellent and diligent collaborators. We use only like-minded agents of the same work ethic and that are regulated. So we do have our keep area experts whilst offering you what you want not just what we have. This service costs you nothing extra. If you wish to consider us as a lead agent (Buyer's agent) we will be delighted to present all the options the area has including area tours. Of all the services we provide to home-buyers, one of the most essential is helping them seek out the best options available to them. Many people feel comfortable knowing that we put ourselves in your shoes and will offer the benefits of what are advantages or disadvantages in a particular area. It is important to have an entry and exit plan unless it is your forever home. We have developed some solid contacts in this area over the years, so before you commit yourself, please feel free to contact us and we can investigate additional options. It's surprising how flexible and accommodating our contacts can be in gratitude of the referrals we send them. Not to mention the tips they’ll tell you; this is transparency from us as they couldn't if you weren't our client. When you decide it’s the right time for you to make a move or step forward, we would love to hear from you. Thank you for taking the time to look up our details.